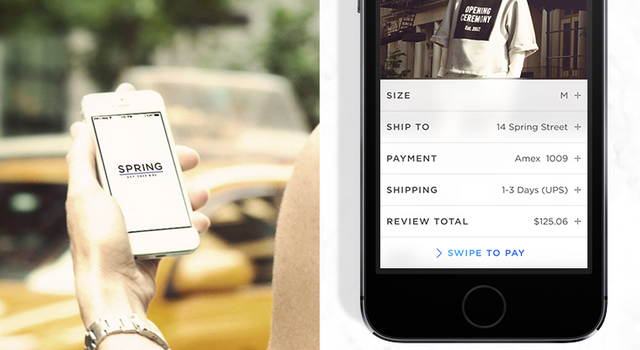 A new startup, Spring, is bringing Tinder functionality to shopping. The mobile app has simplified online shopping by making purchases as easy as swiping right or left. The hope is that in simplifying the order and payment process the app will convert more visitors to customers. One of the main challenges for e-tailers is that the online shopping experience doesn’t secure purchases from browsers in the same way brick and mortar stores do from visiting customers — it’s much easier to get distracted when shopping online. In the past we’ve seen apps such as Keep leverage Instagram snaps to better engage consumers, but now Spring has boiled the buying process down to a single swipe in the hopes of improving conversions. Hailing from the fashion hub of New York City, the free iOS app enables users to follow their favorite brands and designers, presenting new collections in an Instagram-style feed. However, Spring avoids bloating the app with other social features such as liking, commenting and sharing, which are all given a back seat. It instead focuses on the buying process. Customers can set their shipping, billing and size details through their Spring account and can complete a purchase by simply swiping down on any item. A network for buying. http://t.co/m6kybz4ggj Spring encourages Instagram-like shopping, without social fluff. Impulse buyers beware.